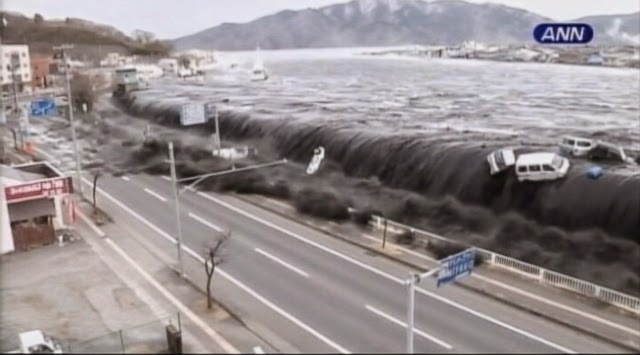 An ocean engineer at the University of Rhode Island has found that a massive underwater landslide, combined with the 9.0 earthquake, was responsible for triggering the deadly tsunami that struck Japan in March 2011. Professor Stephan Grilli, an international leader in the study of tsunamis, said the generally accepted explanation for the cause of the tsunami had been the earthquake, the fifth largest ever measured, which created a significant uplift and subsidence of the seafloor. While that adequately explains the 10-meter surge that affected much of the impacted area, Grilli said it cannot account for the 40-meter waves that struck a 100-kilometer area of Japan’s mountainous Sanriku Coast. His findings were published this week in the journal Marine Geology. In a series of models, Grilli and his former doctoral student Jeff Harris worked backwards in time to recreate the movement of the seafloor from the earthquake and concluded that an additional movement underwater about 100 kilometers north of the earthquake’s epicenter must have occurred to propagate the large waves that struck Sanriku. So the URI engineers and colleagues at the British Geological Survey and the University of Tokyo went looking for evidence that something else happened there. Reviewing surveys of the seafloor conducted by Japanese scientists before and after the earthquake, the scientists found signs of a large slump on the seafloor — a rotational landslide 40 kilometers by 20 kilometers in extent and 2 kilometers thick that traveled down the slope of the Japan Trench, leaving a horizontal footprint the size of Paris that could only have been created by a 100-meter uplift in the seafloor. The earthquake only raised the seafloor 10 meters. Recommended For You Can slow creep along thrust faults help forecast megaquakes? Grilli said it has been difficult to convince his Japanese colleagues of his research group’s results. Most assumed that the massive size of the earthquake was enough to create the waves that were observed. “It raises questions about how we’ve been doing tsunami predictions in the past,” he said. “We generally have just considered the largest possible earthquake, but we seldom consider underwater landslides as an additional source,” even though large tsunamis in 1998 in Papua New Guinea and in 1946 in the Aleutian Islands were found to be generated by a combination of earthquakes and underwater landslides. Grilli also said that his analysis is under considerable scrutiny because it brings into question whether Japan had adequately prepared for natural disasters prior to the 2011 event. Note : The above story is based on materials provided by University of Rhode Island.